Undoubtedly, one of the fundamental sections that every personal or business website must have is a Portfolio. In this section the most outstanding works are generally shown, becoming a showcase of our potential. As well as having a Portfolio full of good works that endorse our performance, the design and functionality of it helps a lot to impress a potential client. For this reason, many of us choose to develop unique Portfolios, with amazing designs and great functionality. The original design belongs to Francesco Zagami, and is published in Dribbble. If you follow this tutorial, you will see that it is not very complicated to achieve, especially thanks to the MomentumSlider library, which we already introduced in a previous tutorial. It is highly recommended that you take a look at that tutorial, since that explains the basics about this library. Before launching ourselves to develop the design, we must think about how we are going to carry it out, always taking into account the technology that we have available. In this case, carefully observing the design, we can see that the Portfolio Carousel is composed of 4 independent sliders (images, numbers, titles and links), but synchronized. With this in mind, we can use the MomentumSlider library without problems, since it allows synchronizing one or several sliders to a main slider. The images could be taken as the main slider, and synchronize the others (numbers, titles and links). The particularities of each slider are also compatible with our library, so we can start the development! Please note that we have not included the rest of the decorative elements that you will see in the final demo, in order to focus on the Portfolio code. In the same way, we will not include the CSS code corresponding to these decorative elements, which undoubtedly will make this tutorial more understandable and easier to follow. In any case, you can always check the complete code in the Github repository. $cssClass: CSS class to match the slider container. $slider-length: Length (width or height) of slider container. $slider-center: If slider should be centered. $slide-width: Fixed width for each slide. $slide-height: Fixed height for each slide. $vertical: If slider should be vertical (true), or horizontal (false). $reverse: If slider should have reversed slides (first items at the end). $debug: Show helpful background colors to help debugging. Of course, all parameters are optional, using the previous values by default. Maybe you have noticed that there are several unnecessary parameters, since they are equal to the default values. However, writing all parameters is recommended to avoid confusion, or to be constantly consulting the mixin code. Also keep in mind that at the beginning, to define the position and dimensions of our slider, it is advisable to define the parameter $debug: true, because this will generate very useful background colors for each element of our slider. This code will be quite easy to understand, especially if you followed the previous tutorial on the MomentumSlider library. As you can see, the sync parameter receives an Array with instances of other sliders that we want to synchronize with the new slider we are creating. Obviously, you must have previously initialized those sliders. In order to focus on the new functionalities of MomentumSliders, we will not detail the code needed to initialize the other sliders, since it is quite similar to what we have already seen. Anyway, in case of any doubt you can consult the full code in Github. One of the main advantages of MomentumSlider is that it allows us to modify the CSS styles of our slider according to our needs without affecting its functionalities. We can add styles of all kinds, as long as we take care not to overwrite the dimensions of the slides. The library offers several functionalities out of the box, but if we want a pagination component we must implement it ourselves. However, this is very simple, as we will describe next. As you have seen, adding a pagination component is relatively easy, thanks to the features offered by the library. That&apos;s it, now our Portfolio Carousel looks great on screens of any size. And that is all! 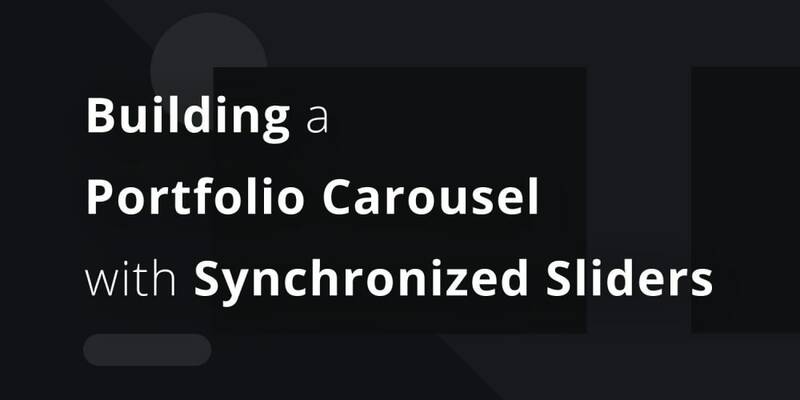 During this tutorial we have seen the essential elements to create an elegant Portfolio Carousel. You can see the final result, as well as the Codepen demo. Also, remember that you can check the complete code in the Github repository, where you can see all the details.